1956 is hailed as a year in which many significant historical, political, social and cultural events took place in Sri Lanka. The release of Viragaya, one of Martin Wickremasinghe’s best novels and the launch of the world-renowned stage play ‘Maname’ of Prof. Ediriweera Sarachchandra in 1956 revolutionised the field of arts. The release of the film ‘Rekawa’ (The Line of Destiny) on 28 December 1956 was a revolutionary initial step in an attempt to symbolise the identity of indigenous Sinhala cinema. Some people view it as the real beginning of the Sri Lankan film industry. 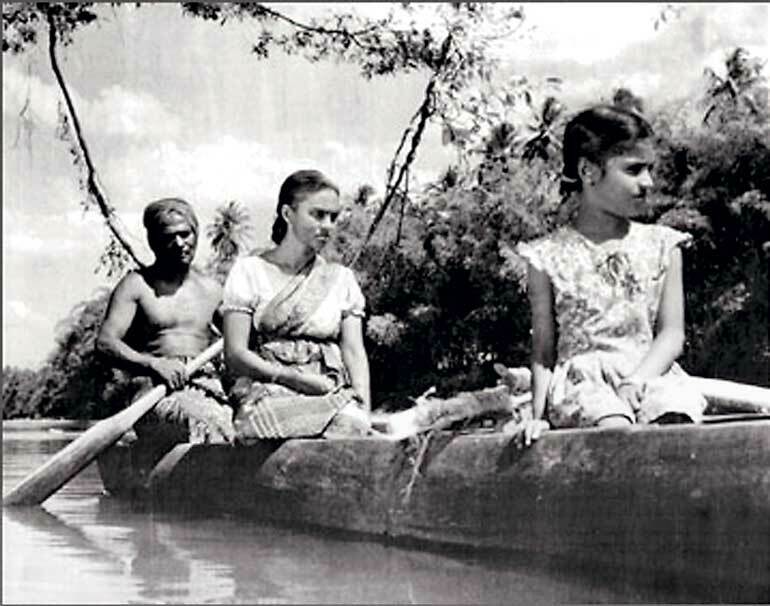 Kadawunu Poronduwa, which was screened on 21 January 1947, was Sri Lanka’s first Sinhala film. It is a common view that films produced in the ’40s and ’50s did not bear an indigenous outlook. Only the cast, dialogue and lyrics of songs were Sinhala but the music, acting, background, etc. were merely trappings of a South Indian outlook. Sirisena Wimalaweera, a pioneering director of Sinhala cinema, who made an invaluable contribution to Sinhala cinema, failed in his endeavour. In the early 1950s, the future father of Sinhala cinema Lester James Peries, who held an ambition of building up the Sri Lankan film industry through the experience he gained from Western nations, returned to Sri Lanka. In my article ‘Dr. Lester James Peiris, Father of Sri Lankan Cinema’ written to coincide with Lester’s 90th birthday, I stated that after his return to Sri Lanka, Lester joined the Government Film Unit (GFU) and worked with Ralph Keene who was the Director of GFU. In the first instance, Lester opted to assist Keene in making a documentary film ‘Nelungama’, which depicted the environment of a real village in Sri Lanka. Later, two documentary films of his own were produced for GFU. It was a golden opportunity in his life for he was to meet Titus Totawatta and Willie Blake, two marvellous characters. Encouraged by these talented friends of qualified knowledge, Lester took the lead in producing ‘Rekawa’ the first historical Sinhala film with a Sri Lankan identity. These three musketeers Lester, Titus and Blake left GFU in 1955 aiming to create films with a Sri Lankan identity. Their untiring effort opened the avenue of brighter opportunity to produce films on national value. It was not an easy task to have launched a successful attempt in making a film revolutionising existing patterns of the Sri Lankan film industry. At the start Lester, Titus and Blake saw many challenges ahead of them. It is appropriate to pen a note on challenges braved in the making of this great production “Rekawa” on the occasion of its 60th anniversary celebrations. The book “Lester by Lester - as told by Kumar de Silva” gives the true picture of making the film Rekawa. Lester in his own words has explained that the story of Rekawa came to his mind when he was working at the GFU. It was a story on a rural village. Even if certain incidents of the story were unbelievable, they have been nicely covered up with the traditional beliefs of rural people. He wanted this story to be given indigenous value and a rural style of life. It was a huge challenge to him as production of such a film would need much financial support. It was only after eight years after screening the first ever Sinhala film that they decided to engage in production of more films of national value. Regrettably, the producers were keener on making profits than investing on new experimental films. Sri Lankan producers of yore preferred South Indian style movies of easy attraction and popularity. During initial discussions among friends, Lester was fortunate to have met Sarath Wijesinghe, a reputed and wealthy estate owner in the Southern Province who was interested in producing a new fangled film. Blessed by his association with high profile personalities like H. W. Jayawardana, he was able to form a group called ‘Chitralanka’ that made investment contributions. Unexpectedly, in the midst of the film being produced, Chitralanka Group halted further financing on the film due to an internal dispute. At this crucial moment, Lester and his colleagues did not give up, but courageously approached Sir Chittampalam Gardiner for financial support to continue the suspended film. Encouragingly, Lester’s association with reputed personalities who realised this difficult situation consented to share their support to complete the film. The other significant disadvantage and challenge was the vacuum left behind with no facilities like laboratories, studios, recording equipment and qualified technicians. The recording of the song Seegiri Landakage sung by Latha Walpola in Rekawa at Radio Ceylon(SLBC) is a case in point. As the quality of recording was not acceptable for the big screen, Lester was compelled to travel to South India with his playback singers for recording at Vahini Studio in Madras. Nearly 38 films have been produced from 1947 to 1956 inside a studio except for a very few outdoor scenes. But Rekawa completely changed this practice and began filming outside the studio, giving a fresh natural cinematic look. This was the first time in Sri Lanka that the shooting of a film was done completely outdoors in natural lighting. The filmmakers who produced films inside the studio do not necessarily step outside as studios are well equipped to stage even outdoor scenes. But this new adventure of Lester and his colleagues opted to go out of the studio and look for suitable locations with natural attractions. Shooting was done in rural locations situated in Bandarawela and Vewala. The Rekawa crew had to live in the village, facing physical and mental difficulties. There is an interesting story related by Lester to Kumar De Silva about how Lester and his crew felt helpless before a certain scene. The final scene of the film was a mother meeting her son under heavy rain. They were in a quandary as to when it would rain because no weather forecast was available. At this difficult moment, Lester was fortunate to meet David Lyn, the world renowned film director who was in Sri Lanka to shoot Bridge on the River Kwai. In realising the grave situation, this director with practical experience suggested the use artificial rain with the support from the fire brigade. Accordingly, Lester selected a location closer to a river, making it easier for the fire brigade to dump water for this worthy cause. Encouraged by the approval of former President J. R. Jayawardane, shooting took place at his estate situated close to the Kelani River. Another major challenge was playback of music and songs. Previous films had been produced with playback music and songs by Indian artists. Music in film was totally South Indian. Even the very few films directed by Sri Lankan musicians were influenced by South Indian music. Having realised the importance of indigenous value, Lester was determined to compose the music for this film with Sri Lankan identity and culture. Accordingly Sunil Shantha, a master musician, was offered the position of Directior of Music for the film Rekawa. Although this request was refused at the beginning, later by the influence of Father Mercelyn Jayakody, Sunil agreed to compose melodies. Among many stories heard about music direction for these songs, it is believed that Sunil Shantha recommended that music be given to B. S. Perera, the famous musician of virtuosity. Lyrics were written by Father Mercelyn Jayakody. K. A. Dayaratna, a reputed musician, composed the background music. Except for Latha Walpola, who had already gained reputation as a singer, all other artists like Sisira Senaratne, Indrani Senaratne, Ivor Dennis and Thilakasiri Fernando became playback singers overnight with these extremely unforgettable creations in Rekawa. The other feature was the nature of the film. It was the first film made from a story based on children. The child artist SomapalaDharmapriya and Martel Fernando played the main roles of the film and nearly 20 to 25 children contributed their share of acting in the film. In recalling the creation of Rekawa, it should be appreciated that it was a highly successful production totally done by Sri Lankan artists and technicians new to the feature films, making a remarkable milestone in the history of Sri Lankan film industry. Although Lester had done documentary films, this was his first feature film. It was a collective attempt of newcomers. This created history, being the first film of Lester, Titus, Blake, K. A. Dayaratna, Father Mercelyn Jayakody, Sunil Shantha, Indrani Senaratna, Irangani Serasinghe, Mallika Pilapitiya, Winston Serasinghe, Gamini Fonseka and K. A. W.Perera et al. who later became giants in revolutionising the film industry. D. R. Nanayakkara, B. S. Perera, Sisira Senarathna and Shesha Palihakkara had only little experience in feature films in their respective fields. Only Latha Walpola and N. R. Dias had significant experience in their relevant fields. Rekawa did not succeed commercially as people were more used to films of a South Indian background. But Rekawa achieved significant recognition after it was screened. At the second Deepasika Award ceremony held in 1957, Rekawa was awarded Best Film, Best Director and Best Actress. Rekawa represented Sri Lanka at the world famous Cannes International Film Festival and Edinburg Film Festival. This was the first time the Sri Lankan National Flag was flying high at an international film festival with great pride. With due recognition showered nationally and internationally, after a few years people deeply felt the immeasurable value of national taste. Some critic writers like Jayavilal Wilegoda highlighted with facts the huge difference between Rekawa and other existing films. These criticisms influenced the production of future films with stories of national value. The directors who followed the commercial Indian nature of films turned a new leaf after Rekawa, producing better pictures of national attraction. ‘Sandeshaya’, directed by Lester, was a case in point as a result of a request made by those producers who preferred traditional types of commercial films. K. Gunaratnam, who had previously made movies of commercial success as Sujatha, Dosthara and Duppathage Duka under a South Indian background, recorded an important milestone in producing historical film ‘Sandeshaya’ with Lester. Dr. Roland A. Fernando, in his book written on Sandeshaya, recollects that the world-renowned Indian Artist Raj Kapoor, after viewing Rekawa, had requested Gunaratnam to produce films with Lester. Rekawa was the real silver line of Sinhala cinema, opening a radical gateway to the Sri Lankan film industry. It was indisputably proved by the films screened in early 1960s’ how Rekawa influenced future productions. Subsequently, films like Kurulu Bedda, SikuruTharuwa and Ganga Addara, filmed outside of studios, with indigenous faces. A. D. Ranjith Kumara wrote a book on Rekawa on the occasion of celebrating the film’s 50th anniversary. I consider it worthwhile to conclude this note with the statement made by one of the renowned actors of yore Laddie Ranasinghe, as stated in Ranjith Kumara’s book. Laddie Ranasinghe paid his highest honour to Rekawa with his statement that Rekawa laid a strong foundation stone for the film industry in Sri Lanka. Finally, he comments as to what sort of acting they displayed behind the silver screen during their time in the past decades (40’s and 50’s) as compared to remarkable performance by Rekawa.